Get US passports and foreign tourist visas processed in under 24 hours with expedited travel document processing services. The centrallized source of information regarding travelling to/from the U.S. Includes passport and visa information and travel alerts and warnings. One day emergency, renewal, first time and lost passport, visa and tourist card services. Provides guaranteed fast passport and visa processing for US citizens and emergency passport processing in as fast as 7 hours. Services offered include: new passport applications, passport renewals, passport amendments and replacement of lost or stolen passports. 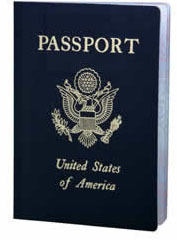 Offers online forms for expedited passport services. Comprehensive information on passport services, visa requirements and applications. Real-time status updates and live help. Offers a full line of US passport services and can obtain other documents such as visas, letters of invitation, legalizations and document translations. Law enforcement organization charged with keeping terrorists and their weapons out of the U.S. while facilitating lawful international travel and trade. Directory & search engine providing a comprehensive list of contact resources for all of the world's diplomatic offices. The FCO promotes the United Kingdom's interests overseas, supporting our citizens and businesses around the globe.